Telephone Conversation: Trajkovski - Stojanov. Macedonian President Boris Trajkovski had a phone conversation today with his Bulgarian counterpart Petar Stojanov, discussing the successful operation for neutralization of the terrorists in Macedonia. Stojanov congratulated to Trajkovki and Prime Minister Ljubcho Georgievski on the successful operation, which was an appropriate response to the extremist activities, the Bulgarian President's Cabinet said. Stojanov stressed that the Macedonian Government energetic measures made the forthcoming dialogue possible, not allowing division of the Macedonian society on ethnic principle. Stojanov reiterated his position that all Macedonia's neighbors and the international community should continue to make efforts in order to prevent armed incidents in Macedonia, which may jeopardize the European future of the Balkans. MINISTER FETAI DELIVERS SPEECH AT THESSALONIKI FORUM. The Greek Plan on restoring the Balkans will be very significant for the development of the Macedonian economy, Macedonian Economy Minister Besnik Fetai stated at the Eighth Forum on the future of the South East European countries, which started Monday in Thessaloniki. Fetai stressed that Macedonia would grant US $83,03 million from the total fund of the Plan, which amount US $358,2 million, MIA reports. According to Fetai, in the first phase these means will be used the economic-social development of Macedonia and afterwards some will be invested in the production process. Fetai announced that the means from the fund would be allocated according to the priority list developed by the Greek Government in cooperation with Macedonia, adding that the means will be primarily used in the agriculture and nonferrous industry. "The Macedonian Government, supported by the Albanian representatives, has succeeded to neutralize the current crisis and to start working on the economic development of the country," Fetai stated, adding that in 2001 Macedonian gross domestic product was expected to increase and it was also expected the direct foreign investments to raise to US $155 million. Greek and Yugoslav Prime Ministers Kostas Simitis and Zoran Zizic, the ministers in the Governments of Macedonia, Albania, Bosnia and Herzegovina, Greece, Yugoslavia and Cyprus, Stability Pact's Special Coordinator for South East Europe Bodo Hombach, representatives of the US State Department, SEE Reconstruction agency, the World Bank and European Bank of Reconstruction and Development attend the two day Forum in Thessaloniki. New gunfire as Macedonia talks held. Talks aimed at ending the grievances of Macedonia's ethnic Albanians have ended in the capital, Skopje, as a 48-hour lull in fighting with rebels was ended by new gunfire. President Boris Trajkovsi, who chaired the three-and-a-half hours of talks, said afterwards that more discussions would follow on proposals which he had put forward. He has the delicate task of satisfying the Albanians' demands for more rights without provoking a backlash from the Slav majority - and with pressure from the outside world to turn the country back from war. The renewed gunfire came in the village of Selce, above the flashpoint city of Tetovo. Security forces exchanged fire with a group of gunmen trying to enter the village, Defence Ministry spokesman Georgi Trendafilov told Reuters news agency. Monday's talks were attended by the largest ethnic Albanian party, the Democratic Party of Albanians, which is in the governing coalition. But they were boycotted by the main ethnic Albanian opposition party, the Party for Democratic Prosperity. President Trajkovski described the boycott as regrettable, but the party defended the move. "The PDP thinks that this unofficial meeting is intended to daze the international community into believing that some talks are taking place in Macedonia and that dialogue continues," PDP spokesman Zahir Bekteshi told Reuters news agency. After the talks, President Trajkovski said a dialogue would continue "that would allow all sectors, all inhabitants of this country to benefit." "We want to create a society of individuals, not ethnic groups," he said. The leader of the DPA, Arben Xhaferi, has threatened to pull out of government unless its demands are met within a month. He has also warned that the rebels will return if progress is not made. "They have not gone. They are here, in civilian clothes. They will see the outcome of our negotiations and if they are not happy they will continue again," he told the French news agency AFP. On Monday morning, the army had reported a completely quiet night, and the authorities said the revolt was at an end. However, their claim a week ago to have successfully driven rebels from the hills around Tetovo proved premature. It is not clear whether the rebels are dead, have fled into Kosovo, or have blended back into the civilian population. But correspondents say the brief rebellion has changed the political situation in Macedonia - with the government accepting that the grievances of the Albanian minority have to be addressed, and the hand of Albanian politicians strengthened. Both the European Union and Nato are also adding pressure for a settlement, fearing another outbreak of war in the Balkans which could destabilise the whole region. The EU's foreign affairs commissioner, Chris Patten, and security chief, Javier Solana, travelled to Skopje on Monday for more talks with the president. "We don't want to be mediators but Mr Solana hopes to find a way of reinvigorating the process and solidifying the national consensus at this time of trouble," said Mr Solana's spokeswoman, Cristina Gallach. A crowd of around 80 anti-western demonstrators was waiting for them at Mr Trajkovski's office, shouting "fascists" and protesting against the idea of compromising with the ethnic Albanians. Macedonia Starts Talks, Albanian Party Boycotts. SKOPJE (Reuters) - Macedonia's political leaders opened talks on Monday to address the Balkan country's ethnic tensions but the meeting was boycotted by the main ethnic Albanian opposition party. European Union security chief Javier Solana was due in the capital Skopje later to support efforts to tackle the grievances of Macedonia's ethnic Albanian minority, which fueled a month-long insurgency. ``The PDP thinks that this unofficial meeting is intended to daze the international community into believing that some talks are taking place in Macedonia and that dialogue continues,'' PDP spokesman Zahir Bekteshi told Reuters. The EU has ruled out playing the role of mediator and Solana's spokesman Cristina Gallach told Reuters on Sunday his visit was aimed at ``reinvigorating'' the political process. Solana was to be accompanied by European Commissioner for External Affairs Chris Patten. Macedonia's one-third ethnic Albanian minority complains of second-class treatment and a small guerrilla army took to the northern hills last month to fight for greater rights. The fragile coalition government led by Slav Prime Minister Ljubco Georgievski held together during the fighting. But key coalition partner Arben Xhaferi, leader of the main ethnic Albanian party, says he will quit the government if his community's demands are not met soon. Xhaferi sent his deputy, Menduh Thaci, to the talks. Ethnic Albanians want to change the constitution, which names Macedonian Slavs as the primary nation, and have called for greater language rights and decentralization of government. But Slav leaders fear a backlash from their own constituency if they concede too much. The Macedonian army said last week that it had completed its operation to drive out rebels from their hillside hideouts. But residents of the village of Tearce, close to the border with the U.N.-governed Yugoslav province of Kosovo, said they had heard a volley of heavy machine-gun fire early on Monday. Alarmed by the prospect of another major conflict in the Balkans, Europe has offered greater links with the EU and increased aid as a reward for making progress toward ethnic reconciliation. Slav and Albanian government leaders have been invited to Luxembourg on April 9 to sign a Stabilization and Association agreement, which is viewed as the first step toward EU membership. But Xhaferi says he will not attend unless genuine negotiations on the demands of ethnic Albanians are under way. KERIM, SOLANA, PATTEN: EU IS HERE TO HELP, NOT TO BE A MEDIATOR. At Monday meeting of EU Foreign Policy Commissioner Chris Patten and the High Representative of Foreign and Security Policy Javier Solana with high Macedonian officials, as well as with leaders of SDSM and DPA, Branko Crvenkovski and Arben Xhaferi, it was concluded that it is of common interest for Macedonia to move closer to the EU. This can be achieved by carrying out political and economic reforms. The improvement of the interethnic relations, as Macedonian Foreign Minister Srdjan Kerim said, was always a part of these reforms. "In order to speed up the process of Macedonia's integration in the EU, Europe would help Macedonia to put into effect the measures it intends to undertake in this context" Kerim said. The basic principles of the Monday talks were, as Kerim said, "against violence and terrorism". "We are against use of force for solving any kind of problems, including the most sensitive ones. The Macedonian territorial integrity and sovereignty are inviolable and the EU completely support this position" Kerim pointed out. "The dialogue existing in the Republic of Macedonia is our own deed, and the European Union will participate as a partner, for which reason we are signing a Stabilisation and Association Agreement. All that will go on within the framework of this dialogue is a prerogative of Macedonian institutions," Minister Kerim said. According to him there is no place left for "estimates, assumptions and fears that any issue, including those regarding the Macedonian Constitution, has been imposed on Macedonia by the European Union". Kerim expressed an assurance that "the dilemma whether to discuss the Macedonian Constitution or not was not the subject of the talks". The Macedonian Foreign Minister emphasised the fact that Macedonia and the EU closely cooperate in anticipation of April 9, the day when the Stabilisation and Association Agreement should be signed. According to him, this day "will enter the Macedonian history, with the same importance as September 8, Macedonian Independence Day". He informed that the highest representatives of the biggest Macedonian opposition parties are also invited at the ceremonial act of signing the Agreement in Luxemburg. 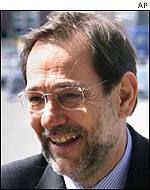 Javier Solana at the press conference estimated the talks to be very good, constructive and positive. He pointed out that the Macedonian President would continue the dialogue with all relevant political parties in Macedonia. "The European Union is here to help, not to be a mediator in this dialogue", Solana said, and added "this dialogue will bring Macedonia closer to the European Union". 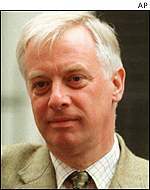 European Union Foreign Policy Commissioner Chris Patten informed that all political leaders that he met committed themselves to democracy, dialogue, protection of Macedonia's vital strategic interests, and moving closer to the European family. He expressed hopes that they all together would continue the work within the frames of the Parliamentary Commission, which would discuss the more efficient implementation of the Agreement's prerequisites. Commenting the statement of DPA's leader Xhaferi saying that he would boycott the signing of the Agreement because he did not expect it to bring developments in relation to Constitutional changes, Kerim said "The Deputy Prime Minister Bedredin Ibrahimi, who is a member of DPA will be a part of the Macedonian delegation in Luxemburg, and will represent both the Macedonian Government and his party". In this context, Solana said, "The Constitution is the highest Act of Law of one country, but the people are those to define, describe or suggest its changes. We may have our opinion on this issue, but it is up to the people and the state to decide how they will live within the framework of this highest Act of Law. The main purpose of the Constitution, in this aspect, is to allow each citizen to feel comfortable in his country". Asked whether the fact that the leader of PDP Imer Imeri was not present at the Monday meeting is due to his demand for negotiations mediated by the EU, Solana repeated that EU would not assume the role of a mediator. Chris Patten commented this question by stressing that it was very clearly explained to Imeri that the European Union can only help, and that it actually does that. "It is being done not only by our frequent visits and meetings, but also through our programs of help to the development of interethnic relations" Patten said, and added "the EU cannot take over the responsibilities of the Macedonia political leaders". "The dialogue has started in the best possible form. The sooner progress is achieved, the better" Patten sad, answering the question whether the leaders of DPA and PDP, Xhaferi and Imeri were unique in their demands regarding the open questions, and whether they consider this to be a start of the dialogue. TRAJKOVSKI, GEORGIEVSKI, KERIM - EU REPRESENTATIVES PATTEN, SOLANA, MEETING. Macedonian President Boris Trajkovski, Prime Minister Ljubco Georgievski and Foreign Minister Srdjan Kerim met Monday with Javier Solana, the European Union High Representative for Common Security and Foreign Policy, and Euro-Commissioner for External Affairs Chris Patten. At the meeting, the EU high officials were informed on the preparations that Macedonia makes in anticipation of the signing of the Stabilization and Association Agreement with the EU. In this context President Trajkovski briefed them on his Monday meeting with the leaders of parliamentary parties where, among other issues, the signing of this Agreement was supported. All political representatives that participated in the meeting pointed out to the determination of Macedonia to intensify the political dialogue on the future measures for complete stabilization of the situation in the state, and to clearly define the orientation toward building of a free civic society. Prime Minister Georgievski talked about the wider activities of the Macedonian Government in relation to the elaborate preparations for signing and implementation of the Agreement. He repeated the fact that Macedonia had built, and would build a society according to European criteria and standards, and in compliance with the regulations that the Agreement would provide. Solana and Patten, expressing their satisfaction with the political consensus that the political parties in Macedonia reached concerning the Agreement, once again condemned violence and terrorism, and reaffirmed the European position of complete support to the protection of Macedonian territorial integrity and sovereignty. After the burial of their sister in Montenegro, prioress and nuns of the Serb Patriarchate of Pec are attacked in Kosovo and Metohija when their car was stoned by Albanians in the town of Pec. The sisters are attacked between 7.30 and 8.00 PM. Italian soldiers didn't give to Serb nuns right protection. Analysis: The EU's role in Macedonia. Hard lessons have been learnt in the Balkans. The European Union is playing an unusually active political role in trying to resolve the crisis in Macedonia after the recent fighting between government forces and ethnic Albanian guerrillas. The Union's two senior foreign policy officials, Javier Solana and Chris Patten, are taking a hand in all party talks in Skopje designed to meet the grievances of the Albanian minority. The United States is taking a back seat for the moment, in contrast to the high-profile diplomacy by former President Bill Clinton's trouble-shooter, Richard Holbrooke, during the Kosovo crisis. 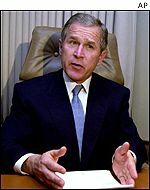 That is partly because of President George W Bush's desire that Europe should take more of the burden in the Balkans, its own backyard. And partly because the Bush administration is still developing - or arguing about - what its policy should be in various hot spots. So the EU has an opportunity to demonstrate that it can conduct an effective foreign policy. Mr Patten expressed his support to Macedonia. And there is, in fact, no disagreement between it and Washington. Both condemn the violence of the Albanian guerrillas and support the territorial integrity of Macedonia. Both also call for further reforms in building a multi-ethnic society and extending minority rights, in order to isolate the extremists. Macedonia is not another Kosovo. There are Albanians in the government, and education laws have recently been revised to increase the number of schools where children can be taught in Albanian. But the minority - up to 30% of the population - complain that they cannot get jobs in the public sector, and that the special police and the upper ranks of the army are almost exclusively Macedonian Slav. The key symbolic issue is the constitution, which defines Macedonia as a state made up of Macedonians - that is Slavs - and minorities. The Bush administration is still developing its policy. The Albanians want a specific reference to them. They will undoubtedly seek ammunition in the documents on minority rights drawn up in the last decade by the Council of Europe and the Organisation for Security and Co-operation in Europe (OSCE). The OSCE's Commissioner on National Minorities, Max van der Stoel, said in February that one cornerstone of a stable multi-ethnic country was a constitution that reflected the true character of society and included guarantees for the rights of all citizens. There are detailed European recommendations on education, language and participation in public life for the negotiators to draw on. Given this background, it seems natural for the EU in the shape of Mr Solana and Mr Patten to get involved in trying to promote agreement between Macedonian Slavs and Albanians. But they stress they will not be leading the talks, only trying to act as facilitators. Before they went to Skopje, they took part in a joint EU-Nato meeting - both to add weight to their mission and to emphasise that the two organisations would not be duplicating their efforts. Mr Solana made a high-profile visit to Tetovo. Nato, including the United States, is trying to prevent guerrilla incursions from Kosovo but does not want to intervene militarily inside Macedonia. The EU's main lever on the Macedonian government is economic aid, and the carrot is eventual membership of the Union. That prospect will be formalised next Monday in Luxembourg, when the EU is due to sign a Stabilisation and Association Agreement with Macedonia. Hard lessons have been learnt in the Balkans, and the Europeans are now trying to move faster. Some European officials say they are picking up the pieces from the former mistaken policy of giving too much backing to the Albanian guerrillas in Kosovo. Washington is the main target here. 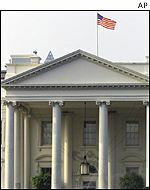 The White House is Washington's ultimate point of reference. But the EU is still hampered in playing a global political role by its very nature: a collection of 15 member states who must all agree on policy. If a sudden crisis develops in Skopje, Mr Solana and Mr Patten cannot decide what to do on their own. Lengthy consultations between the capitals would be necessary. By contrast, if Washington were to decide to get involved again, an American mediator would have only one ultimate point of reference for a quick decision: the White House. The United States also has the ultimate sanction of military force. Despite the controversy over EU defence plans, there is no equivalent European capacity. Peacekeepers Find Arms Cache Near Macedonia Border. PRISTINA, Apr 2, 2001 -- (Reuters) NATO-led peacekeepers in Kosovo have found a large cache of weapons, ammunition and explosives in a camp apparently abandoned by ethnic Albanian guerrillas near the Macedonian border. An official of the force said peacekeepers had known about the camp near the village of Krivenik for at least two weeks. He would not say why NATO soldiers had failed to shut down the rebel base, despite requests from Macedonia for the peacekeepers to take a more active role in hindering rebel movement from rear depots in Kosovo. The cache included more than 100 grenades, a shoulder-fired anti-tank rocket, three anti-tank missiles, 67 mines, more than 150 mortar rounds, machine guns and ammunition, the KFOR peacekeeping mission said in a statement on Monday. 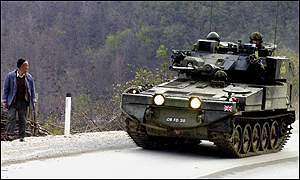 The Macedonian army has been fighting ethnic Albanian rebels in the mountains along its border with the UN-governed Yugoslav province of Kosovo for more than a month. "We knew there was a training camp there because we could see it from the air. We knew a lot of NLA (guerrilla) fighters came to the camp for a few hours and then would go back (to their positions)," said the official who declined to be named. NATO shared its surveillance information with the Macedonian army but Skopje's forces were unable to pin down the guerrillas, the official said. Macedonia launched a heavy assault on the area just south of Krivenik last week to crush the rebellion. Mortars later slammed into the village, killing two ethnic Albanian civilians and a British television producer. NATO officials are privately blaming the Macedonian army for the cross-border shelling. Skopje has denied responsibility for the attack while the guerrillas say they do not possess the type of weapon responsible for the deaths. Peacekeepers are still investigating the mortar attack. 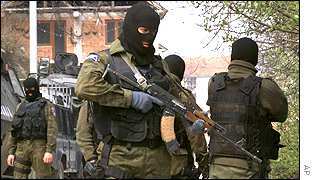 Macedonia says it has completed its military operation to drive out guerrillas from their hillside hideouts. But residents in the village of Tearce, a few kilometers (miles) west of Gracani, said they heard a brief volley of heavy machine-gun fire early on Monday morning.